Last spring we had the opportunity to buy a couple of Landrace sows well worth the money, so we bought one and our son and his wife bought another. The plan is to have the sows kept at our sons and when the piglets are big enough to wean, they will be moved to our place to feed out. We will buy a boar soon, that will also be kept at our place so that the workload is shared, the feed bill is shared and there won’t be problems with the sows and boar “mingling” unless we want them to. The sows were bred prior to our purchase and all went well for about three months as they prepared to become mothers again. We found a mix of feed that they liked, was cost effective and fairly close to home. Our son made a pen behind a shed where they had plenty of shade from the hot summer sun and shelter from the rains we have been blessed with having so many of all summer. A few weeks before they were due to deliver a pen was built outside his barn, and panels were put up that would allow the sows to be separated as they had their litters. All was well and on September 9th JD woke to 12 healthy happy baby pigs from the first sow. Life was good and we were excited. If the second sow had close to this many, we could sell the extras for enough to pay for the feed we would have in our own butcher pigs and enough to recoup what we had paid for the sows. 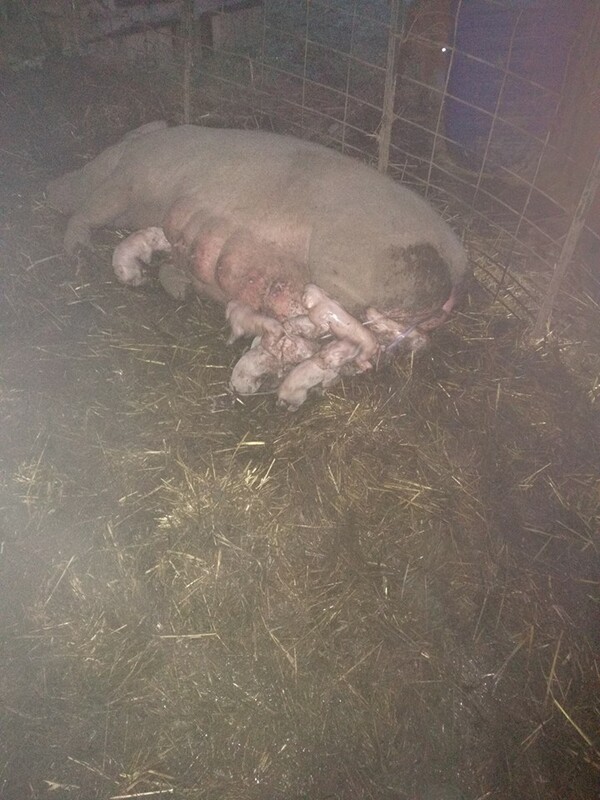 Our joy was short lived, as the mama managed to lay on and suffocate one piglet after another until there were only 7 left. She is large. She is used to being in a confined space where she barely had room to lay down. Now she is in a much larger area and has never learned to lay down gently so that the babies can scamper out of her way. The planning for building farrowing crates in the inside space has already begun for next time. On September 9th the second sow, began having hers and ultimately also had 12. Mama #1 had continued to have problems laying down without getting on top of her babies and we down to 4 from the first litter of 12. Some of the excitement returned however, as we were now back up to 16 piglets which would be more than enough to make the plan to sell what we didn’t want to butcher work out. The excitement was short-lived. The second mama was also used to being in a confined space, so she mashed 2 or 3 of hers as well. As disappointing as this was, the real grief came on September 12th. 3 days after she gave birth, Mama #2 grabbed each piglet, one at a time and bit their heads. JD only got to witness the last one or two, and could not stop her actions. All her piglets were dead. So, from 24 piglets, we now have 4 left. This represents an 84% loss. As Modern Missouri Pioneers, frustrating, discouraging, heartbreaking can all describe what we feel about this. But after considering the worst of the scenario I began to imagine how the Pioneers of the past would have felt about this and how it would have affected their lives. I have many other meat sources at my disposal. We have rabbits, chickens, fish, beef, and venison all in the freezer at this time. I will not starve with the loss that we’ve had. I will be able to feed my family healthy meals all winter and not be reliant on braving the elements to hunt for deer or turkey. There is no question where my next meal will come from. While the loss is disappointing, our survival and livelihood are not endangered by it. We still have enough for our family to butcher, barring any further loss. It is time to learn from our mistakes. Time to find a good boar that will become a part of the farm. It is time work over the next few months to build appropriate farrowing crates, and have a safe place for the sows to have their next litters. A place where the piglets will have a space to retreat when Mama lays down to nurse them. It is time to research what makes a sow kill her own young and do what we can to prevent that in the future. And, if it can’t be prevented, then when the cools some more, it will be time to make some whole hog sausage! We have options, many more options that our forefathers did. It is a good time to learn from our mistakes and become even better Modern Missouri Pioneers.